Signage is a critical element of any brand promotion strategy. On-premise signs identify your location and help your customers find your business or organization. LED signs offer more than the typical fixed sign because the message on your LED sign can be changed - quickly, easily and safely - allowing you to reach more potential customers with targeted advertising messages. The cost of advertising ? whether newspaper, yellow pages, radio, or other form of media ? is based on the cost per thousand exposures (CPM) of getting that message to the public. Not only are LED signs the most cost-effective CPM for any medium, they're also targeting the most valuable audience possible - the person driving right past your business. Unlike other forms of advertising that "shotgun blast" your message to a broad area of people, your sign is reaching your immediate community and becomes a landmark for your business. YOU own the advertising and can change it any time you want. Your advertising works 24 hours a day, 365 days a year, with minimal cost. 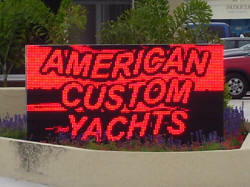 Your LED sign acts as a ?salesman on the street? attracting customers into the business. Your advertising speaks directly to the potential customers as they drive past the business location. Your can select your own market and direct your message to that market at any given time. Learn more about the power of LED advertising. Need help making a buying decision? ElectronicSigns.com is here to help. Check out our Buying Tips for information to help you make the right decision for your LED sign project. Or give us a call at 800-341-6397.